As adults, we frequently forget just how very stressful childhood can be. The children of today have more opportunities than ever open to them, and yet they are under more pressure than any other generation before them to produce and achieve. Most children do not have time to simply relax and just be a child. If you have a child who is under many demands from school and extracurricular activities and you want to help them relax, consider meditation. As a parent, you want the best for your child, but you also want to be able to help them when they feel overloaded. Meditation can help your child feel peaceful and relaxed as well as create a renewed sense of motivation and welfare. It helps the child turn inward and develop a sense of inner tranquility. They can learn to be in control of their own thoughts and emotions and it can give them a foundation on which positive self-esteem can be built. Meditation is something that will not only help them as children, but also be something they can use throughout the rest of their life during stressful times. In some metropolitan cities, you may find centres that specifically offer meditation classes for children. But you can guide your child through meditation yourself. Sit down with your child and explain what meditation is and how it can benefit them. You may want to search your local bookshop or online for a book about meditation or a guided meditation CD. If you do not have a guided meditation CD, look for CDs that have sounds of nature such as falling raindrops, the waves crashing in the ocean, or insects in the forest. These sounds can help put your child (and you) in a state of relaxation. Let them meditate wherever they want, but make sure there are not any distractions. If they want to meditate in their room, make sure they turn off any electronics that might distract them such as a television, video game, mobile phone or computer. They can sit in any position or even lay down – whatever makes them feel comfortable. You can tell them to clear their mind of all their thoughts or you can ask them to think of a particularly happy time in their life – a birthday party, Christmas, a play they starred in at school. Just have them think of something happy and try to concentrate only on that one event. 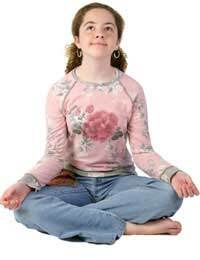 There are examples of different types of meditation for children online. For younger children, dancing meditation may work best. This consists of 10 minutes of lively music in which your child is allowed to dance, sing, and move as they wish. This is followed by 5 minutes of quite time, with the music turned off and the child being as still as possible. After that, ask them to lie on their backs for 5 minutes with their eyes closed. You can also include deep breathing exercises to help them relax and calm down. Unlike adults, who are often very willing to just sit quietly after a long day of work, it may not be as easy to get your child to settle down, especially children who are full of energy. If your child has trouble focusing, do not get angry or push them. It may help if you meditate at the same time to set a good example for them. Some parents prefer to set a time for their child’s meditation. Usually, right before bed is a good time. This helps the child calm down from a busy day and may even help them fall into a deeper, better sleep. Even 10 minutes of meditation each day can help your child refocus and revitalise their health. If your child resists the meditation, just keep trying and setting a good example for them by meditating yourself. Most children will eventually become curious and want to try it themselves.